I recently had the honor to be invited on a small conference about the future of web development recently. 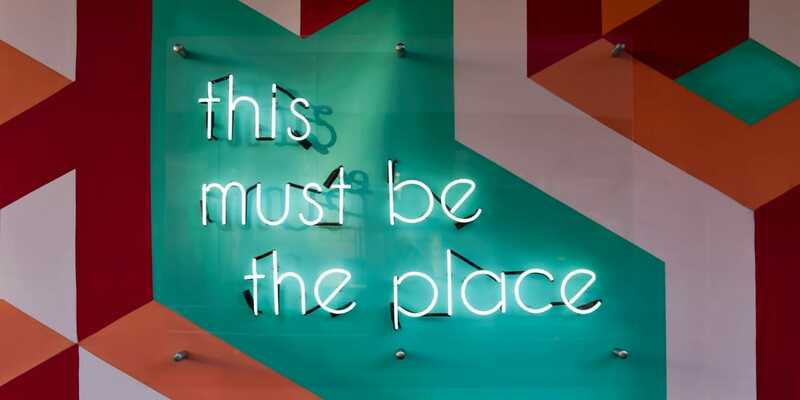 I want to share my insights with you in this quick review of the talks, including insights on progressive web apps, meteor.js, microsoft azure and the data science stack. Timo Horstschaefer from Ledgy showed how to create modern single page apps with meteor.js. Although every framework promises to "ship more with less code", he showed that for their project Ledgy - which is a mobile app to allocate shares among stakeholders - they were able to actually write it in less than 3 months using 13'000 lines of code. In comparison to other web frameworks where there is a backend side, that is written in one language (e.g. ruby - rails, python - django etc..) and a js-heavy frontend framework (e.g. react or angular) meteor does things differently by also offering a tightly coupled frontend and a backend part written purely in js. The backend is mostly a node component. In their case it is really slim, by only having 500 lines of code. It is mainly responsible for data consistency and authentication, while all the other logic simply runs in the client. Such client projects really shine especially when having to deal with shaky Internet connections, because meteor takes care of all the data transmission in the backend, and catches up on the changes once it has regained accessibility. Although meteor seemed to have had a rough patch in the community in 2015 and 2016 it is heading for a strong come back. The framework is highly opinionated, but I personally really liked the high abstraction level, which seemed to allow the team a blazingly fast time to market. 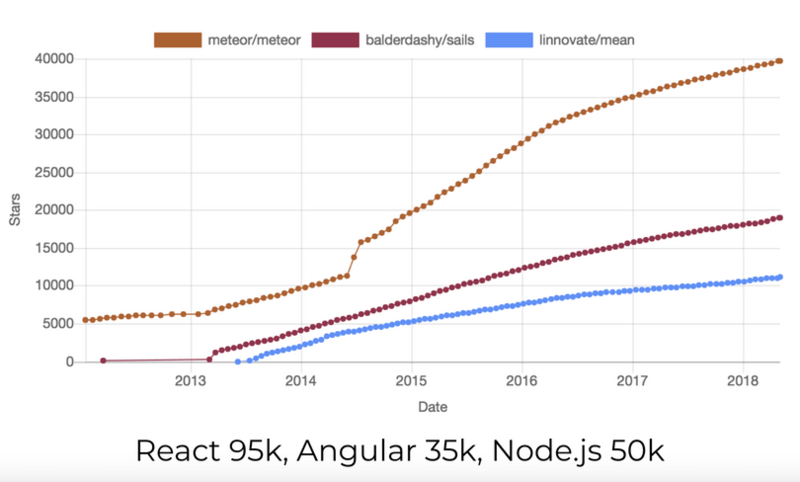 A quite favorable development seems to be that Meteor is trying to open up beyond MongoDB as a database by offering their own GraphQL client (Apollo) that even outshines Facebook's own client, and so offers developers freedom on the choice of a database solution. I highly encourage you to have a look at Timo's presentation. 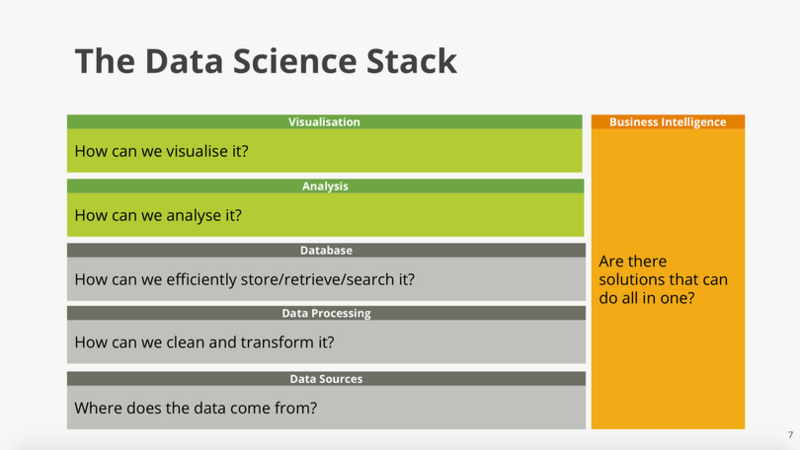 Then it was my turn to present the data science stack. I won't bother you about the contents of my talk, since I've already blogged about it in detail here. If you still want to have a look at the presentation, you can download it of course. In the talk offered a very subjective birds eyes view on how the data centric perspective touches modern web standards. An interesting feedback from the panel was the question if such an overview really helps our developers to create better solutions. I personally think that having such maps or collections for orientation helps especially people in junior positions to expand their field of view. I think it might also help senior staff to look beyond their comfort zone, and overcome the saying "if everything you have is a hammer, then every problem looks like a nail to you" - so using the same set of tools for every project. Yet I think the biggest benefit might be to offer the client a really unbiased perspective on his options, of which he might have many more than some big vendors are trying to make him believe. Meinrad Weiss from Microsoft offered interesting insights into a glimpse of the Azure universe, showing us the many options on how data can be stored in an azure cloud. While some facts were indeed surprising, for example Microsoft being unable to find two data centers that were more than 400 miles apart in Switzerland (apparently the country is too small!) other facts like the majority of clients still operating in the SQL paradigm were less surprising. One thing that really amazed me was their "really big" storage solution so basically everything beyond 40 peta!-bytes: The data is spread into 60! storage blobs that operate independently of the computational resources, which can be scaled for demand on top of the data layer. In comparison to a classical hadoop stack where the computation and the data are baked into one node, here the customer can scale up his computational power temporarily and then scale it down after he has finished his computations, so saving a bit of money. In regards to the bill though such solutions are not cheap - we are talking about roughly 5 digits per month entrance price, so not really the typical KMU scenario. 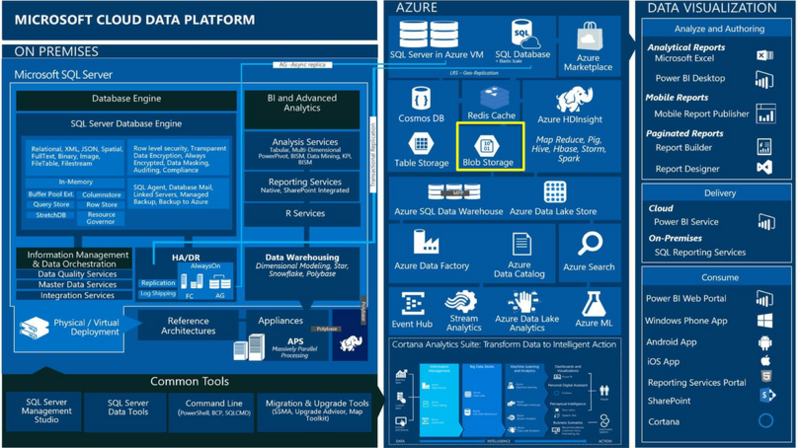 Have a look at the presentation if you want a quick refresher on current options for big data storage at Microsoft Azure. An interesting insight was also that while a lot of different paradigms have emerged in the last years, Microsoft managed to include them all (e.g. Gremlin Graph, Cassandra, MongoDB) in their database services unifying their interfaces in one SQL endpoint. Nicro Martin, a leading Web and Frontend Developer from the Say Hello agency showcased how the web is coming back to mobile again. Coming back? Yes you heard right. If thought you were doing mobile first for many years now, you are right to ask why it is coming back. As it turns out (according to a recent comscore report from 2017) although people are indeed using their mobile heavily, they are spending 87% of their time inside apps and not browsing the web. Which might be surprising. On the other hand though, while apps seem to dominate the mobile usage, more than 50% of people don't install any new apps on their phone, simply because they are happy with the ones the have. Actually they spend 80% of their time in the top 3 apps. That poses a really difficult problem for new apps - how can they get their foot into the door with such a highly habitualized behavior. 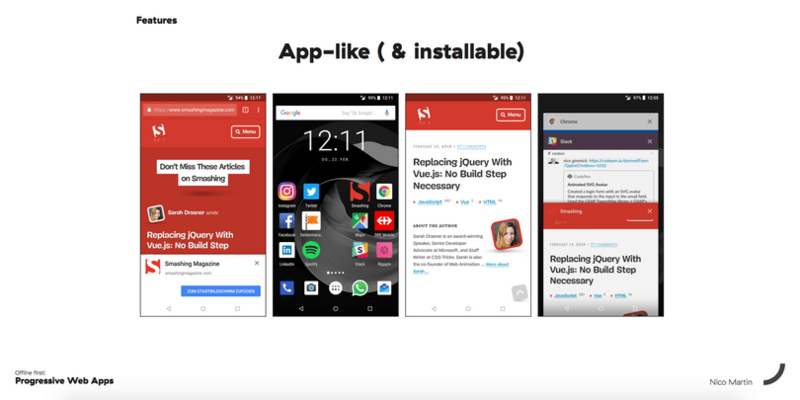 One potential answer might be Progressive Web apps, a standard defined by Apple and Google already quite a few years ago, that seeks to offer a highly responsive and fast website behavior that feels almost like an application. To pull this off, the main idea is that a so called "service worker" - a piece of code that is installed on the mobile and continues running in the background - is making it possible for these web apps to for example send notifications to users while she is not using the website. So rather something that users know from their classical native apps. Another very trivial benefit is that you can install these apps on your home screen, and by tapping them it feels like really using an app and not browsing a website (e.g. there is no browser address bar). Finally the whole website can operate in offline mode too, thanks to a smart caching mechanism, that allows developers to decide what to store on the mobile in contrast to what the browser cache normally does. If you feel like trying out one of these apps I highly recommend to try out mobile.twitter.com, where Google and Twitter sat together and tried to showcase everything that is possible with this new technology. If you are using an Android phone, these apps should work right away, but if you are using an Apple phone make sure to at least have the most recent update 11.3 that finally supports progressive apps for apple devices. While Apple slightly opened the door to PWAs I fear that their lack of support for the major features might have something to do with politics. After all, developers circumventing the app store and interacting with their customers without an intermediary doesn’t leave much love for Apples beloved app store. Have a look at Martin's great presentation here. Overall although the topics were a bit diverse, but I definitely enjoyed the conference. A big thanks goes to the organizers of Internet Briefing series who do an amazing job of constantly organizing those conferences in a monthly fashing. These are definitely a good way to exchange best practices and eventually learn something new. For me it was the motivation to finally get my hands dirty with progressive web apps, knowing that you don't really need much to make these work. As usual I am happy to hear your comments on these topics and hope that you enjoyed that little summary.